Print and present this ecard to PALMER's roadshow at Mid Valley Megamall to redeem your doorgifts! 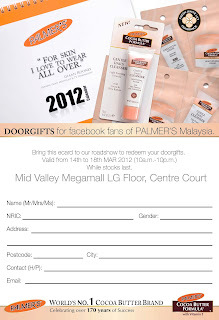 Check out also PALMER's latest shopping catalogue for the roadshow! Check out PALMER's Malaysia facebook page for more information. PALMER's is world's no. 1 cocoa butter brand, celebrating over 170 years of Success. PALMER'S is loved by millions, including such famous names as Naomi Campbell, Tyra Banks, Beyonce and Hilary Duff. Become a fan of this cult beauty favourite and transform dull, dry skin into smooth, soft & radiant skin you’ll love to wear. PALMER'S uses only the finest ingredients to provide consumers the highest quality formulas at prices that everyone can afford. All of our products are hand crafted based on PALMER'S long standing heritage and experience in offering superior formulations that deliver results. This is why PALMER'S promise to its consumers has always been an unconditional guarantee of quality.